Sprinkles make everything better, don’t they? 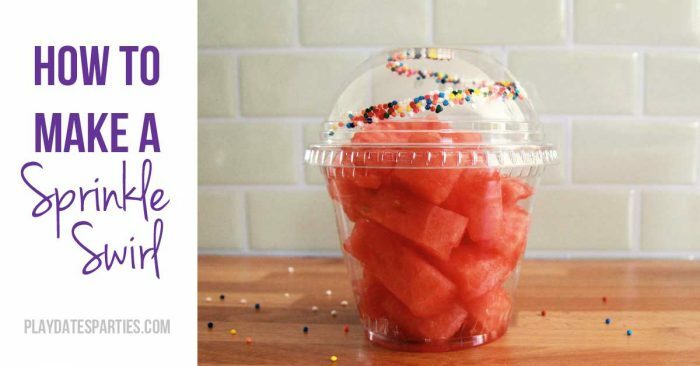 Find out how to make a sprinkle swirl in a cup lid to wow your guests at your next party. 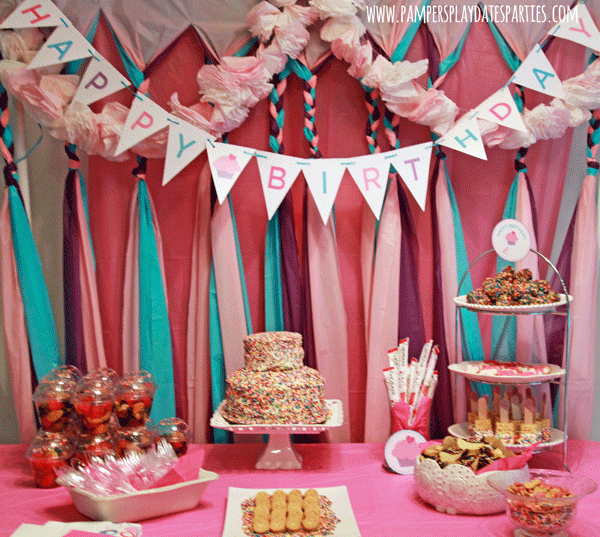 I’m always looking for fun ways to serve healthier foods at our kids birthday parties. Fresh fruit and veggies are a staple in our party menus, but since our kids’ summer birthday parties are almost always held outside that also means there are plenty of bugs. And those bugs always love fresh fruit. 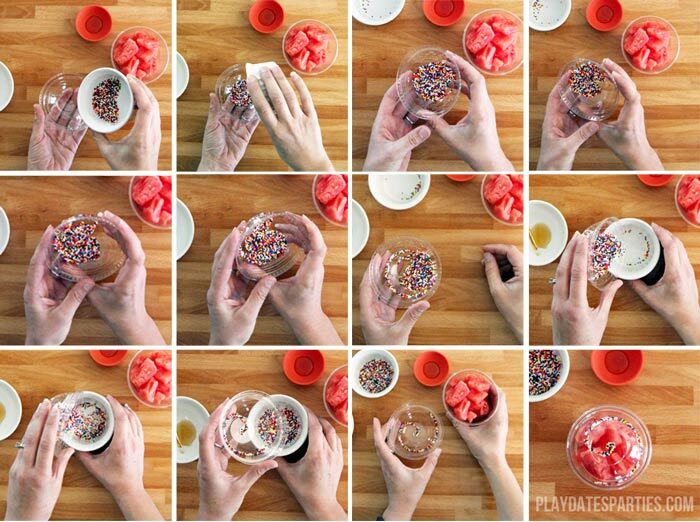 I recently realized that even though L is only a couple short months away from her 4th birthday now, that I never got a chance to respond to the requests for how to create the adorable sprinkle swirl in the fruit salad cups. Better late than never, right? Anyway, to solve the bug problem, individual portions in closed cups are the way to go. Originally, the cups were going to hold yogurt parfaits for the kids, just like you would get at a bakery. And when I saw how Sprinkle Bakes added a sprinkle swirl to a milkshake, I fell in love. The only problem with the plan was that sprinkles swirled inside a cup full of yogurt or other wet food would bleed if made in advance. Bleeding sprinkles just aren’t cute. So the swirl got moved from inside the cup to inside the lid, which turned out to be just perfect! After making them, I think they would be especially adorable with a bit of whipped cream between the fruit and the top. The white would really make those sprinkles pop. But I was trying to keep this snack as healthy as possible, so opted out of the whipped cream for the party and for this tutorial. Pour some honey into a small dish. Dip a small, angled brush into the honey or syrup and use it to make a small circle in the middle of the cup lid. Keep the brush at an angle and turn the cup lid, painting a swirl of honey around the lid. Add more honey to your brush as needed. When the honey swirl is complete, pour some sprinkles into the cup lid and gently spin them around the lid. The sprinkles will stick to the honey that was painted on the lid. 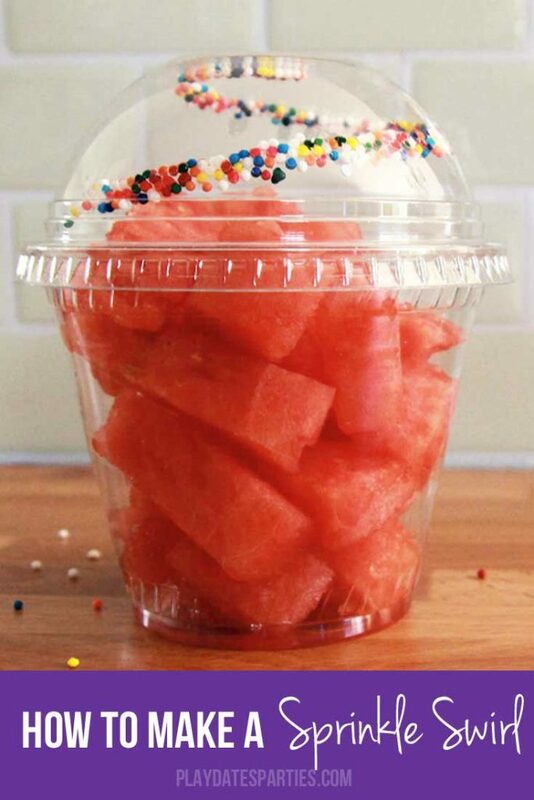 Pour out any extra sprinkles and place the lid on top of the filled cup. 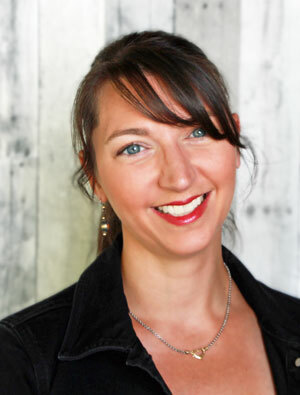 Prepare to wow your guests with a simple, but fun twist! 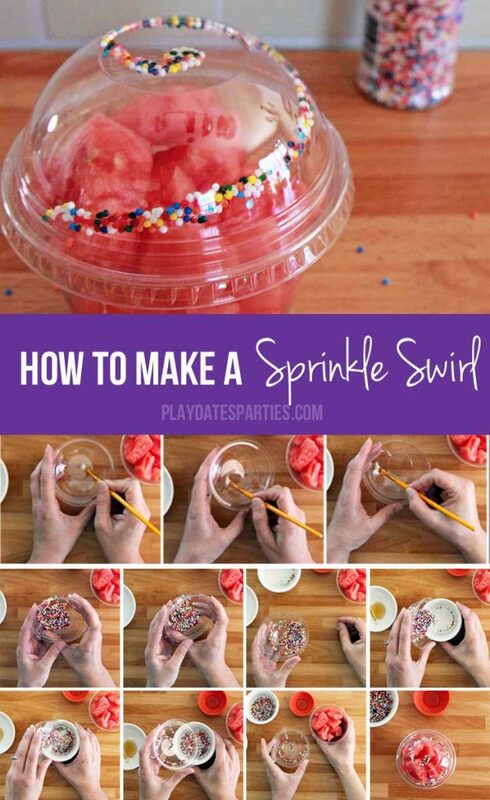 What’s your favorite way to use sprinkles? What would you serve with a sprinkle swirl? There are so many ways to use these! I’m thinking that a pudding cup with a couple nilla wafers on top and a squirt of whipped cream would be adorable with this garnish! I can’t take all the credit, Nina. I just figured out a way to use the swirl without it bleeding too quickly! Glad you like it! It’s definitely really cute, and the girls LOVE it. Of course, they love licking the sprinkles and honey just as much as they love eating the fruit! What a GREAT idea! Pining! It’s like you’re living in my brain. I think you know how much I love sprinkles. L and I should have a joint party! Except my birthday is in July. I will take these tips seriously! Haha! Well, L’s birthday is at the end of June, so it’s nearly July! You’ll probably go nuts whenever I post about our new pantry. So many sprinkles! Leslie this is so clever! I love it! Using for a future birthday for sure. I hope you do Morgan! You are fantastic at finding creative twists, I’d love to see how you switch it up! This are adorable what a great idea! 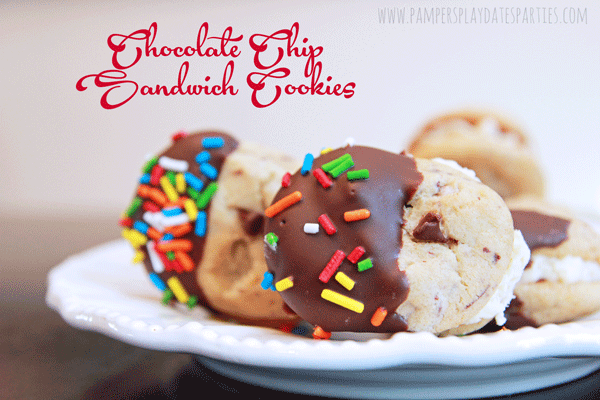 Super cute without going overboard on sprinkles. What a fun idea! It really adds a festive touch to an otherwise boring container. I can see this being useful for many food items!